The camaraderie of close friends, the isolation from reality, the longing for something more, the limitless future, and the dead ends to nowhere. Trying for the girl that you know is so far out of your league, but you so desperately want that you’ll do anything to make a connection. Because you’re young and anything is possible. You haven’t been beat down yet. And when you do fall you just pick yourself up and figure out a way go on. The incomparable beauty of youth and its utter fragileness that coexist side by side with the impending disaster that lurks just around every corner, but hey you’re 18, you’re indestructible, and you’re going to live forever. 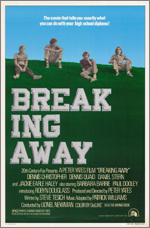 Breaking Away is a timeless and flawless portrayal of those golden, perfect, time stopping moments of late teenage life. It’s nothing short of a masterpiece. Like all great art it continues to reveal itself as time goes on. This is the closest thing to a time machine I will ever get in my lifetime. I lived this movie, I was there, I took part in this. These characters were my friends. That’s me on the screen! And whenever I need to be reminded of what it’s like to be young and vibratingly alive I watch this film.